Jake LaMotta, the boxing champion whose memoir inspired Martin Scorsese's Raging Bull has passed away. LaMotta died in a Miami nursing home due to complications with pneumonia, TMZ reports. LaMotta's wife confirmed the news while another family member said that his condition has deteriorated quite a bit over the fast weeks after he was put on a feeding tube, which he kept pulling out. LaMotta's wife said, "I just want people to know, he was a great, sweet, sensitive, strong, compelling man with a great sense of humor, with eyes that danced." LaMotta's memoir inspired Martin Scorsese and his 1980 movie, Raging Bull, which Robert De Niro won an Academy Award for his portrayal of the troubled boxer. The movie is widely considered one of Scorsese's best, as well as one of the best American movies of all time. In 1990, it was named to the Library of Congress' National Film Registry, which honors works that are considered "culturally, historically, or aesthetically significant." An unauthorized sequel to Raging Bull was released just this year with William Forsythe (Raising Arizona) portraying LaMotta. The movie was intended to be called Raging Bull II, but MGM threatened legal action and the movie was retitled to The Bronx Bull in an effort to clarify that the movie is not related at all to Scorsese's authorized Raging Bull. Giacobbe "Jake" LaMotta was born July 10th, 1922 in the Bronx, New York City. His mother was born in the United States, while his father was from Messina, Italy. Young LaMotta was forced by his father to fight other kids for the enjoyment of the surrounding adults, who would throw pocket change into the ring. LaMotta's father would collect the money and use it to help pay the bills. At the age of 19, LaMotta stepped up his boxing talents and turned pro and was rejected from military service in World War II due to a mastoid operation on one of his ears. LaMotta was not known much as a puncher in his professional career, but he was a rough fighter, nicknamed "The Raging Bull," because of the savage beatings he would subject his opponents to in the ring. His use of constant stalking, brawling, and inside fighting gave him the reputation of being a "bully" and he is often referred to today as a swarmer and a slugger. His thick skull and jaw muscles were able to absorb the blows from opponents and he took in considerable amounts of punishment over the course of his professional boxing career. LaMotta was also known as having one of the best chins in boxing history. 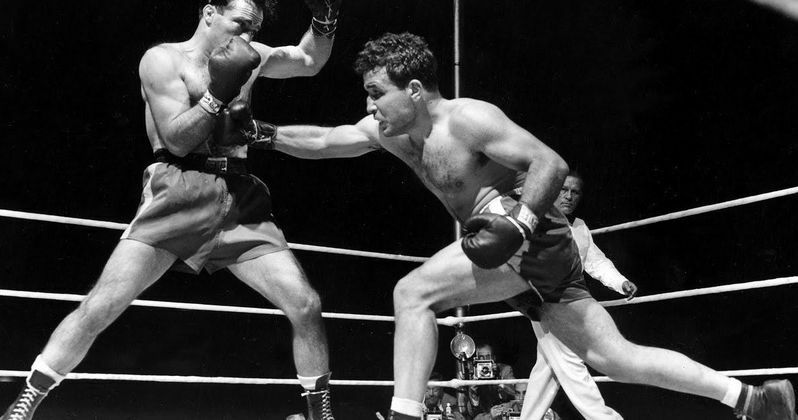 Jake LaMotta led a colorful life after pro boxing, getting in trouble with the law and even starting an entertainment career as an actor and stand-up comedian. LaMotta appeared in more than 15 movies and TV shows, most notably The Hustler in 1961 alongside Paul Newman and Jackie Gleason where he played a bartender. In 1970, he wrote his autobiography, Raging Bull: My Story, which Martin Scorsese went on to adapt into a major motion picture. In preparation for the role, Robert De Niro gained 60 pounds and trained with LaMotta until he thought that he was ready to box professionally. RIP, Jake LaMotta.